Grotesque Indoor Festival 2013 presents the line up! Saturday, October 19th should be noted in your agenda with a red marker. 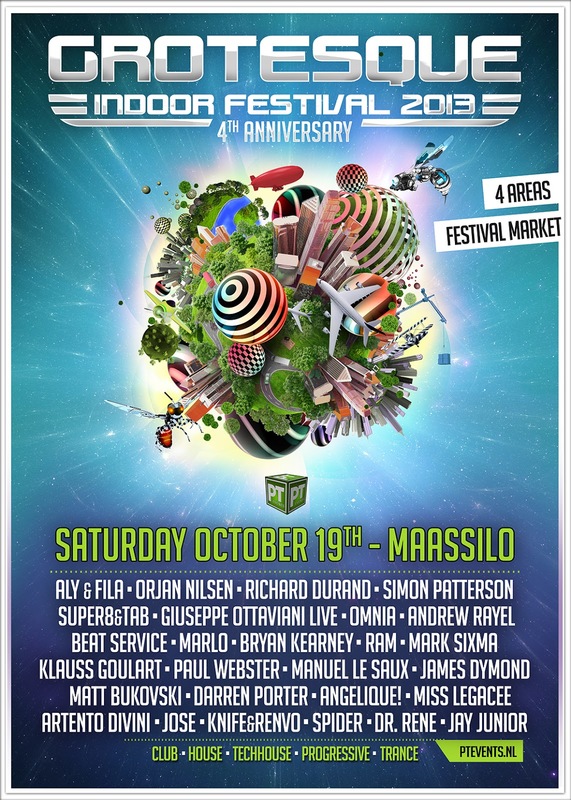 After the sensational success of last year, this year PT Events is back with the second edition of their Grotesque Indoor Festival and again, the Rotterdam Maassilo is available for at least equalling the show of 2012. PT Events announced the entire line-up last week and the first 500 early bird tickets flew away and are already sold out! It will be for those who love Electronic Dance Music a massive week in October. From Wednesday the 16th the Amsterdam Dance Event will start, world’s largest EDM conference including the best dance events the world has to offer. For PT Events it is an excellent opportunity to link the Grotesque Indoor Festival to this world wide renowned event. The festival will have 4 areas this year, of course with the various music styles as you could expect, as well entertainment, a festival market and impressive light and laser shows. The Maassilo, a highly impressive venue! Maassilo is one of Holland’s best venues. This famous hotspot in Rotterdam is dripping with industrial character and this old factory didn’t change much since 100 years ago. With the authentic machines still inside, the underground passes and spaces make the venue itself already a true experience. For more impressions you can take a look in the photo gallery at PT's website. Last year the line-up was already huge and many great artists attended Rotterdam. This year Grotesque tries to go even a step further. Check the full line-up below and mention for yourself! You better don't miss-out! If you don’t want to miss this year’s massive event of Grotesque, PT Events offers for the quick responders a second early bird of €30,=. So you can attend with an attractive discount, the prices of the tickets will get higher during the time. You can buy them through PT Events, Easyticket or through the ticket portal on Facebook. As you know, todays Facebook is the most important social media to get more attention to an event. “We want to challenge our crowd to give us the best support possible at Facebook and we reward them with a special VIP treatment” announces PT Events. The 50 best promoters will have an upgrade this evening, including free coins, free fresh fruit and access to the special artist deck in the main area. All you have to do is share, invite your friends and support our Facebook pages.